Building applications for small screen sizes is always a big challenge. 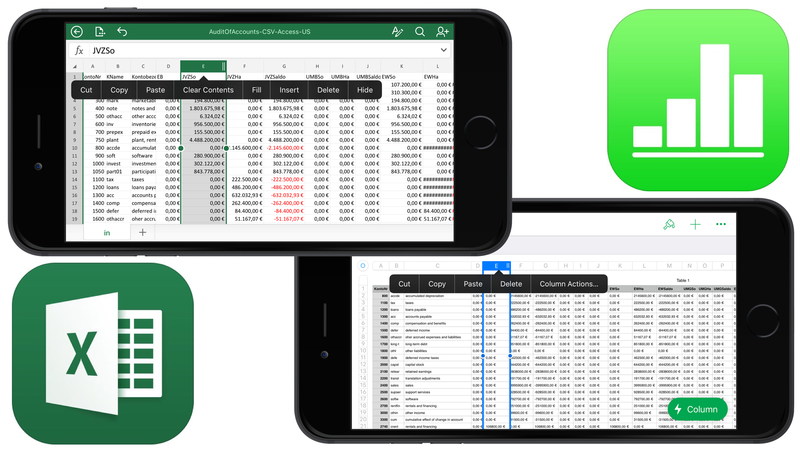 Apple and Microsoft both offer their productivity suites iWork resp. Office for smartphones. If you never tried to create or use a spreadsheet on a smartphone I’m quite sure you would say that it’s against all right ideas about how things ought to be. Well, I’m sure you would revise your opinion if you try it out for some days. The first versions of Office for iOS were far behind Apple’s iWork suite but today the tables have turned. Microsoft overtook lots of innovative ideas Apple implemented in their mobile app versions. I don’t care about copycats. I’m a user and so I’m just interested in perfect solutions whoever created them. Microsoft reconquered the pole position if it comes to Excel vs. Numbers. And the reason is that Apple did a very poor job with its latest update for its spreadsheet app NUMBERS. Entering data and moving the focus from cell to cell is a disaster. I would like to know who at Apple is responsible for the final inspection of the UI. Transfer him for disciplinary reasons, maybe he is better in testing the Apple car. I would also like to know why Microsoft’s iOS versions of Office are a lot better than their Windows 10 Mobile counterparts. Sad but true.